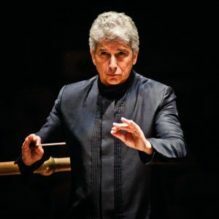 Currently Music Director of the Toronto Symphony Orchestra, this season sees Peter Oundjian take up the position of Music Director with the Royal Scottish National Orchestra. As well as a number of performances in and around Scotland, the first season of Oundjian’s tenure features a tour of China, including concerts in Guangzhou, Shenzhen, Beijing, Tianjin and Macau. A regular guest conductor, recent and future engagements include concerts with the Radio-Sinfonieorchester Stuttgart des SWR, Royal Stockholm Philharmonic and Israel Philharmonic orchestras, as well as the Orchestre de Paris and the Rundfunk Sinfonieorchester Berlin. Continuing his ongoing relationship with the Orchestre Philharmonique de Radio France, Oundjian conducts the premiere of a new piece by Krystof Maratka in Paris, and takes them to Prague to open the Spring Festival. Previous and upcoming US highlights include concerts with the Detroit, Cincinnati, The Philadelphia, Chicago, Boston, San Francisco and St Louis symphony orchestras. Further afield, he traveled to Australia to conduct the Sydney Symphony and will make his Japanese debut with the NHK Symphony Orchestra in 2013.